Last month I had a much needed revision break and headed down to London for a weekend! It was mainly to see the Arctic Monkeys at Finsbury Park (which was amazing!!) and obviously couldn't resist a visit to MAC and Selfridges! I bought three things which I'd had on my wishlist for sometime. First up, the infamous Illamasqua Skin Base Foundation. 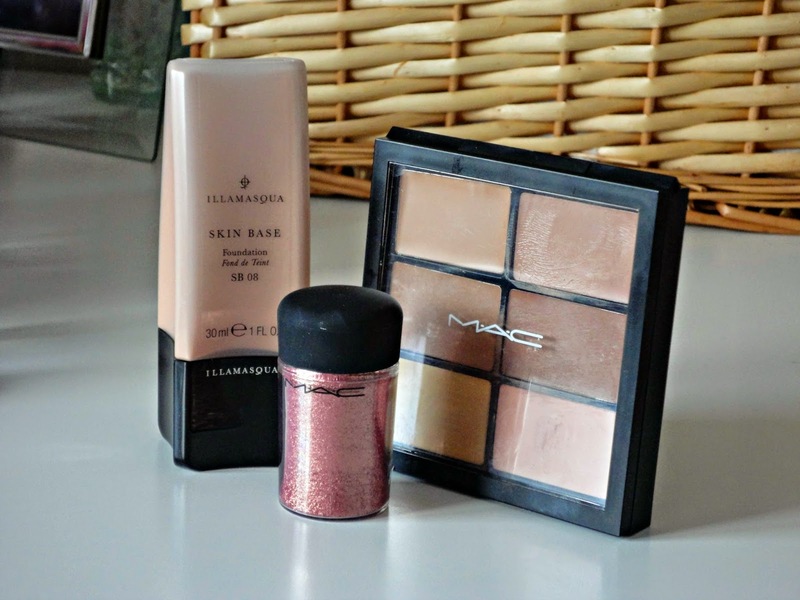 Torn between this and the Georgio Armani Luminous Silk, I plumped for this one as I wanted a fuller coverage 'night out' foundation that matched my faux-tanned skin. I was matched to 08 and after trialling it on a night out a couple of weeks ago, I can say it's the perfect match! Secondly, the MAC Pigment in 'Rose'. I can't remember which video I have seen this used in (a sign that I watch waaay too many makeup tutorials), but this gorgeous pigment caught my eye; a rosey pink with tiny gold flecks in. This is my second MAC pigment and I am still getting the hang of how best to apply them etc (tips welcome!) but it gives a gorgeous colour and I was really happy to see that the gold transfers onto the lid nicely too. Lastly, I splurged on the MAC Pro Conceal and Correct Palette in Medium. I'd got it into my head that I'd love something for cream contouring, and this palette is absolutely perfect. It provides two shades that match my skin when I've fake tanned for blemishes/under eyes, two shades for contouring and two peach and yellow shades for colour correcting. They are all the Studio Finish formula and are really long lasting as you would expect from MAC. For £35, I've been really impressed as I've used all 6 shades already (one shade sets you back £15) and there's not one dud in the palette.